The Thruxton R transfixed and enticed me more than any other bike there. I was gobsmacked to be honest. In the flesh the bike was simply beautiful and the little touches like the throttle bodies made to look like Amal carbs set this bike apart from many other modern classics. The closest bike in pure beauty at the same show was Norton’s newish Commando. Itself a great bike, not perfect or course, but in the flesh it was equally as gorgeous as the Thruxton. What the Triumph promised was mass production refinery, and that’s something the Norton has been unable to deliver. Please don’t think I’m picking on the Norton, I’m not, but it is the closest competitor to the Thruxton in my mind at least. No doubt some buyers will look between the two. Pricing for the Thruxton R is $21,100, $18,700 for the base Thruxton 1200, and $18,900 for the Thruxton 1200 in the premium Metallic White. Told ya it looks good in white. Thruxton. It’s a pretty famous name. Triumph isn’t the only British manufacturer to use it for one of their models. Velocette also used it, but that hardly matters anymore seeing they went bust eons ago. The last real ‘moment’ for a Triumph Thruxton was in 1969 when former ‘Ton Up Boy’ turned racer Malcolm Uphill did the first ever 100mp/h lap of the TT for a production bike, on a Bonneville Thruxton. Impressive stuff. 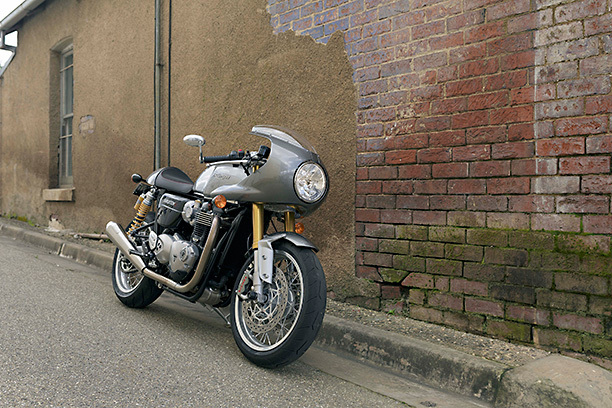 Triumph’s new-era Thruxton was released in 2003, using the same engine as the Bonnevilles. The model has been updated sparingly in the ensuing years, but was always a sub 900cc parallel twin. For 2016 the engine is all-new, not much bigger in actual physical size but way bigger in capacity, now 1200cc. It also has a whole new look. 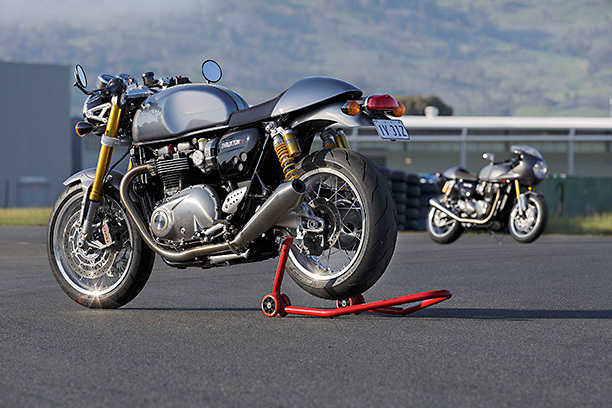 The outgoing Thruxton was a pretty bike, the new one even more so. This engine is shared by the new T120 Bonneville and the Thruxton. 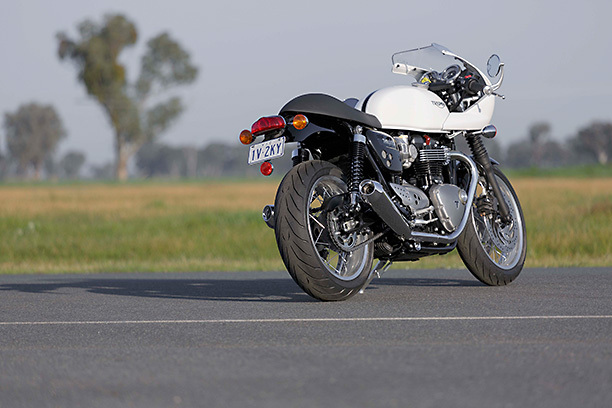 The Bonnie’s engine has been retuned for a bit more torque at the expense of a little top end, while the Thruxton and the R have the same power output. The main changes between the Thruxton and the R are in the suspension and some electronics. 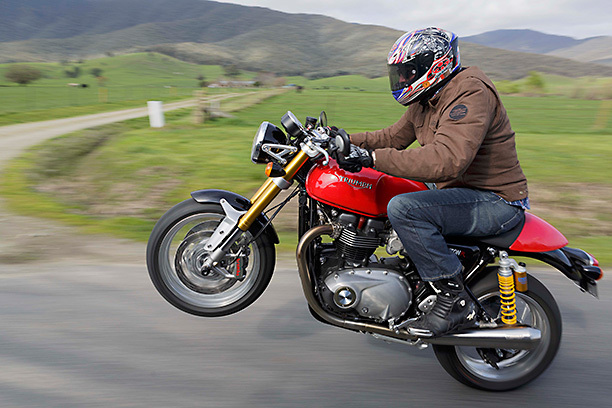 Just as a comparison, the Thruxton has a massive 62 per cent increase in torque over the old Bonnie engined machines. I really didn’t know what to expect with the new 1200cc engine. 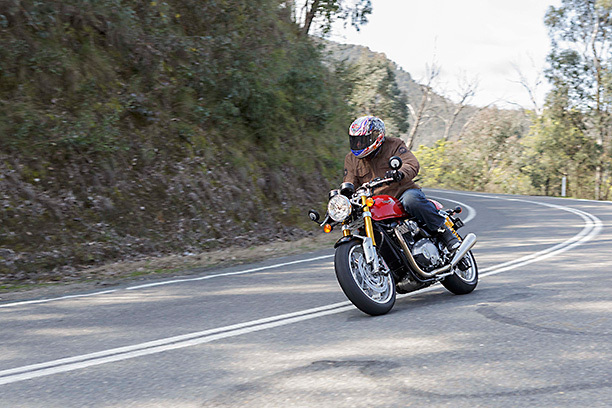 I had earlier ridden the Street Twin and loved it, with more torque the engine was way better on the road than the outgoing Bonnie engine. With 1200cc I expected the new big bore donk to have way more power again. It does but probably not as much as I expected. I wasn’t disappointed, as it has plenty or usable power and good torque, it’s just that a modern 1200cc engine usually has 140 plus horsepower these days. A sign of the times I guess. But really, that’s not what this bike is about, and I’m glad Triumph didn’t build an engine like that for this bike. It’s hard to compare the old engine to the new, as it’s pretty much all-new. There’s no engineering inside the cases that’s going to be used by NASA for the next Mars landing. It’s all regular stuff. Liquid-cooling brings it into the 21st century, and I really like how Triumph has hidden the radiator in plain sight between the frame downtubes. 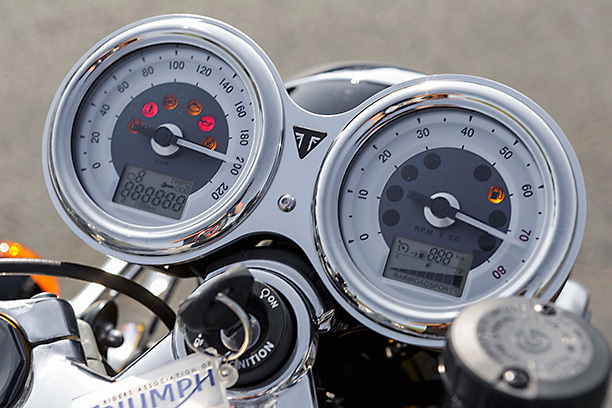 Triumph has resisted trying to make the Thruxton R something it’s not, by adding a plethora of electronics. There are three Rider Modes, Rain, Road and Sport. Ride-by-wire controls this, with Road Mode having a more direct throttle response than Rain Mode, and Sports Mode more direct again. Traction Control is there too, and has one setting across the range of modes. It is switchable, ABS works the same. Riding Modes can be changed on the fly but TC and ABS can only be switched when stationary. If you must know, it does nice wheel stands with traction control turned off. The only thing I didn’t like was all settings return to standard if you switch the bike off. So it’s Road Mode, traction ABS on every time you kick her in the guts. I get that it’s a safety feature but what’s the point of being able to change them if they reset to standard? Most riders will get sick of changing modes every time so my money says they won’t play around with it after the new car smell wears off. If I owned the bike, I’d want the settings to stay where I’d last had them. On the road, the bike has good acceleration, and is quite flexible. Top gear is a an overdrive but doesn’t mind being lugged in 6th if you are a bit lazy at times. Redline is around 8000 rpm and it will rev right through that before hitting the limiter. There’s no benefit to doing that, power drops off about 7500 rpm. Overall impressions are of a very usable engine with more than enough grunt and top end for a bike in this market sector. I preferred Sports Mode over Road Mode, it had good initial throttle action without being twitchy, or too direct. With a tubular steel frame and a basic alloy swingarm there’s nothing spectacular about the chassis of the R, on paper at least. Fully-adjustable suspension is used front and rear, not cutting edge stuff but pretty good all the same. Showa Big Piston Forks are used and it’s hard to fault them, both on the road and the track. Twin Öhlins shocks are used, and these don’t have the level of adjustability as the forks. On country roads the sports suspension performed admirably well, soaking up most things without slamming the rider too hard. Big bumps in the road went right through to the keeper but generally it was all very amicable between the rider and the Thruxton R’s suspension. On the track they performed very well. 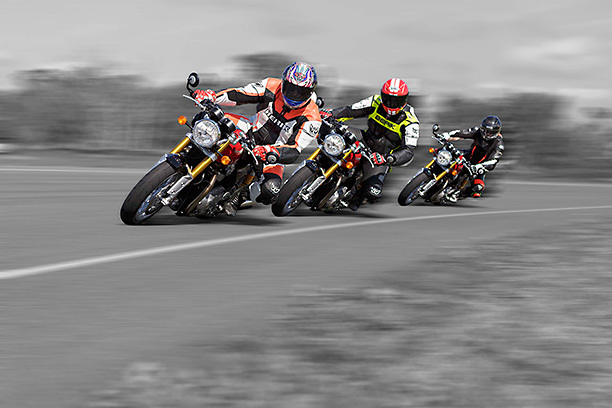 Faster riders chose to up the compression damping which made them firmer and raised the rear ever so slightly, improving ground clearance along the way. The only part that touched down for me were the footpegs, and that was on the track not the road. All good, and to be expected seeing the riding position is very rider friendly. Triumph nailed the riding position, it suited me to a tee. Brakes were great too, and once again well suited to the type of bike this is. 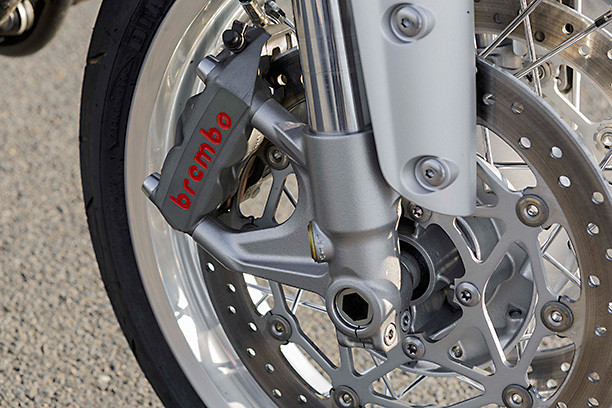 The racing-spec Brembo Monobloc callipers had more than enough feel and power for me. There are stronger brakes on the market, Brembo included, but they would be overkill on the Thruxton. I mentioned the Amal-lookalike throttle bodies and how nice a touch they are. The rest of the bike is a credit to Triumph’s designers too. The upswept pipes, the lines of the tank and seat, the Monza fuel cap, the wide 17-inch wire wheels and the instrument binnacle. All gorgeous. The Race Kit fairing is even more-so. Mmmm, now that is one sweet looking package. 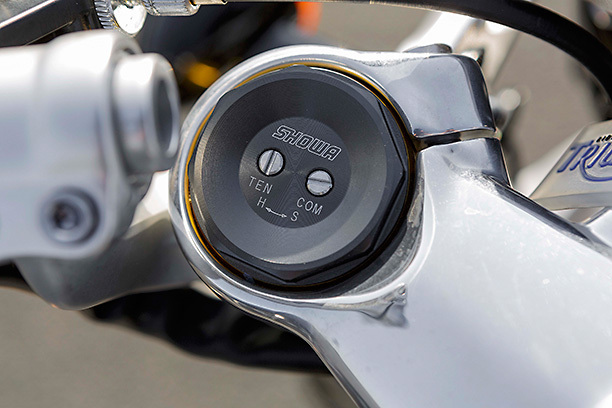 It’s part of a kit which comes with clip-on handlebars but you can also use the inch or so higher standard Thruxton handlebars as well. This comes with big bore headers with no catalytic converter. These are continued into race slip-on mufflers. Backing this up are washable air filters, ‘fruitier’ cams, and the clip-ons for that ‘racer’ crouch. All for closed circuit competition mind you… Yeah right! There’s a heap of accessories as well, like the fairing kit I mentioned, but also luggage, bling and so on. In fully-kitted form with the loud pipes, the fairing, small bar end mirrors and so on, this bike has to be one of the sweetest looking at the moment. As tested none of the bikes had pillion footpegs or a pillion-friendly seat but you can get those as accessories so don’t fear if your other half wants in. Even though the Thruxton R isn’t a sportsbike per-se, it is a very good track tool. We had access to a go kart style track, one more free-flowing than a regular kart track (but it wasn’t Phillip Island if you get my drift). There were tight corners and fast flowing ones, a good test for the track capabilities of the bike. I was impressed to say the least, and you could have a real lot of fun at a track day on the Thruxton R.
With the Pirelli Diablo Rosso Corsa tyres there was plenty of grip on hand too. I even managed a track outing on the standard Thruxton which has basic unadjustable forks and shocks. It doesn’t have the Sports Mode either. I had high hopes for the Thruxton and its R version. I’m happy to say they lived up to them too. Here is a bike with the right amount of retro café racer style to suit everyone’s tastes, and the power and handling more than match its style. 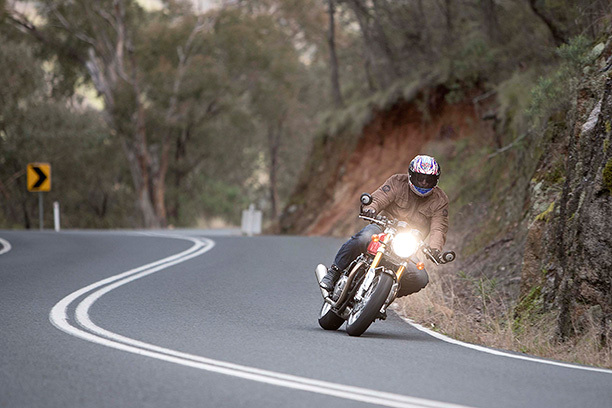 It backs up what it promises, and that’s something not every modern retro café racer can boast.